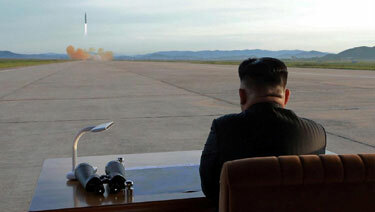 5 Feedbacks on "Photo of the Year"
I can see his purported need for a chair, desk, binoculars…but why the desk lamp? Is there a really, really, really long extension cord somewhere. Fox keeps giving people like Gen. Keane (Ret.) and Amb. Bolton lots of air time, and they keep pushing the line that a military strike against the North and a trade embargo against China are necessary. Unfortunately, Pres. Trump and Secs. Tillerson and Mattis are making similar statements. Do they not listen to the Chinese and Russians? Or are they so besotted with delusions of power that they cannot think? Our leaders insist that the World, all of it, submit to any demand that they make no matter how humiliating or outrageous. We are closer to nuclear war right now than at any time since WW II, including the Cuban Missile Crisis, which I lived through. Then we had the nowadays despised John Kennedy, and he was able to reach a deal with Khrushchev. Now, our leaders refuse to even contemplate any kind of negotiation. Only submission is acceptable to them. Perhaps this country deserves to burn in nuclear fires.